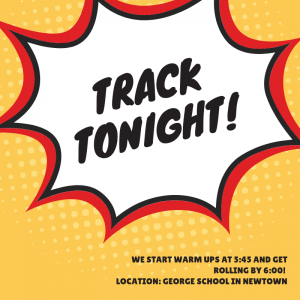 Workout schedules, location changes, and other information pertaining to BCRR track workouts are posted here, in season (early spring through late fall). The current workout schedule is typically posted by mid-afternoon, on day of workout. You know what day it is....YUP TRACK DAY!! Come join us tonight at 5:45 for warm up & drills then by 6pm we get rolling for the workout! Here's what's on the menu tonight! 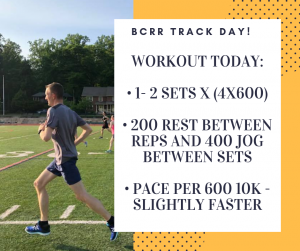 1 Mile Easy + Drills & … [Read more...] about BCRR Track Wednesday’s! Hey team!! Sorry I didn't post the initial workout here for the "Wing It Wednesday" first session! However, you will find them here weekly along with FB! Without further adieu...the workout! Warm Up: 1 … [Read more...] about Wednesday Workout!! Last Track Workout Till April! Happy Wednesday Crew! It's been a blast this season, so let's go out with a bang! We can either do a conventional workout or we can do a relay based workout! 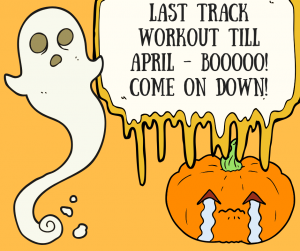 I'm leaving it up to the group … [Read more...] about Last Track Workout Till April! ONLY TWO TRACK WORKOUTS LEFT! COME DOWN! Hey crew! Hope everyone had a great weekend! Next week we are having a social and if you dress up in costume you get some free stuff! So why not dress up at track practice too! 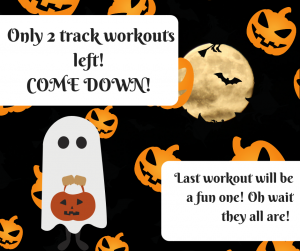 Here's what we have in … [Read more...] about ONLY TWO TRACK WORKOUTS LEFT! COME DOWN!